It’s 1st September, and a happy release day to my latest (and eighth) book, Ravenfall, published by Clan Destine Press. If you have pre-ordered the paperback, today’s the day your retailer will send it to you on black feathery wings! 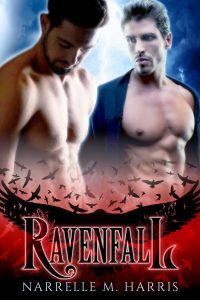 Set in contemporary London, Ravenfall is the story of James Sharpe, a vampire who wonders if it’s possible to fallin love, since he doesn’t even know if he has a soul, and Gabriel Dare, an artist who’s wondered all his life if he was mad but he’s pretty sure about one thing – James Sharpe is the best thing in his life. Can he convince James of the same? They’ll find those answers together, provided they survive all the other monsters who have schemes of their own. People are dying, nobody is safe, and even the undead can die. James and Gabriel will have to risk it all in order to be together for as much of forever as they can manage. Curious, Gabriel stabbed the tip of the silver knife into the jar of garlic, and placed it in the dish of vampire blood. The blood fizzed, coagulated and gave off a terrible stink. ‘Better toss the silverware out too, then,’ he said. Gabriel was inclined to argue the point, but James was staring at the dish of blackened vampire blood in fascinated horror. ‘We don’t have to do this now,’ Gabriel offered gently. Gabriel reached for James’s shoulder, echoing James’s earlier solace. Gabriel’s leaned across the table to kiss James’s mouth. Their lips met, soft and chaste and sweet. James’s skin warmed under Gabriel’s tender touch. He didn’t kiss back, exactly, but with his head tilted up, his whole stance softened, relaxed, held still, and he received the kiss like a benediction. When Gabriel drew away, James’s eyes were closed. Mark Ravenfall To Read on Goodreads now! The ebook is coming in a month.